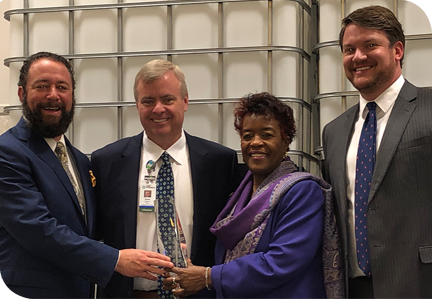 Albany, Ga. – The Albany-Dougherty Economic Development Commission (EDC) presented Phoebe with its Economic Impact Award Wednesday. “Caring for our community is more than just healing the body. It also means helping fuel growth and promoting economic stability. Whether it is partnering with educational institutions, making sure home-grown talent has the opportunity to thrive locally or investing in top-notch medical professionals and cutting-edge technology, Phoebe is dedicated to its mission of helping people in our community live healthier and happier lives,” said Justin Strickland, President of the Albany-Dougherty EDC. Phoebe President & CEO Scott Steiner accepted the award at the EDC’s annual Industry Celebration Luncheon. “While our top priority every day is providing quality healthcare and excellent customer service to our patients, we are extremely proud of the fact that we are a primary economic engine for southwest Georgia,” Steiner said. “We take our responsibility to be a good corporate citizen very seriously, and we will continue to work closely with the EDC to strengthen our region’s economy. According to the most recent statistics from the Georgia Hospital Association, Phoebe generated more than $1.28 billion for the local and state economy in 2016. Phoebe employs around 4,500 workers, making it the largest employer in southwest Georgia, and it supports more than 8,000 other full-time jobs in the region. “Ultimately, our major employers have a huge impact on our small business community. We’re so proud of our excellent industries,” said Barbara Rivera Holmes, President & CEO of the Albany Area Chamber of Commerce. Over the past three years, Phoebe has invested more than $120 million in capital improvements. Those projects include new procedures such as transcatheter aortic valve replacement, new technology such as new linear accelerators for improved cancer treatment and a low-dose 256-slice CT scanner to provide the highest-quality imaging services, and new facilities such as primary care clinics in Camilla and Ellaville. Steiner also congratulated the other award winners. “Our community is lucky to have a large and diverse group of employers. I appreciate the amazing work going on at the industries that were honored today, and the Phoebe Family is grateful for the opportunity to provide healthcare to those employees,” Steiner said. PHOTO (L – R): Chris Cohilas, Dougherty County Commission Chairman; Scott Steiner, Phoebe Pres. & CEO; Dorothy Hubbard, Mayor of Albany; Justin Strickland, Albany-Dougherty EDC Pres.